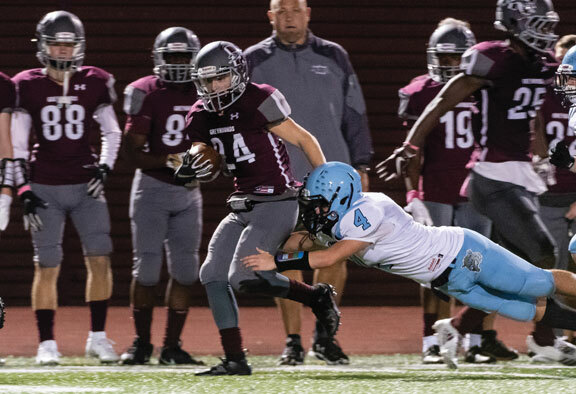 Dave Sollazzo has only been on the field for one Naugatuck-Woodland football game, but even he’s disappointed that the Greyhounds and Hawks won’t get together on the gridiron this fall — and he knows his players are even more bummed. Both teams entered the midseason bye week with matching 5-0 records, but two of the Naugatuck Valley League’s top three teams won’t play each other for the first time since Woodland joined the league in 2003. The rivalry is arguably the NVL’s most passionate among players, coaches, students and fan bases. It began with the legendary Halloween game in 2003 and took another step up with addition of the George Pinho Trophy in 2013. Woodland leads the all-time series, 11-4, but Naugy has a 3-2 edge in games played since the introduction of the Pinho Trophy. The rivalry was put on the shelf this year because of the league’s realignment and scheduling rules. Woodland and Naugatuck had played in the same division since 2007 — the Copper from 2007-13 and the Iron from 2014-17. Over the summer, the Hawks swapped divisions with St. Paul, landing them back in the Copper. Due to the NVL’s power-based scheduling rules (which work on two-year cycles), Woodland and Naugy aren’t scheduled to play this fall. ’Hounds rolling: Since their relatively tight victory in Wolcott to open the season, nobody has come even close to the Greyhounds. Naugy has outscored its five opponents, 219-19, including a 49-7 pasting of Oxford on Oct. 5 before the midseason bye week. Sollazzo acknowledged improvement in all three phases of the game as keys to success so far. He also noted the play of junior quarterback Jay Mezzo and senior linebacker Mike Natkiel. 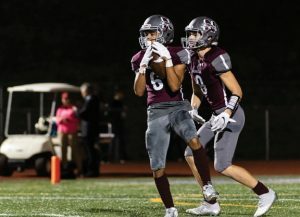 Naugatuck was ranked ninth in the Week 5 state media poll. During the midseason bye week, Sollazzo said he wanted to focus on physical maintenance by spending plenty of time in the weight room. Naugy will be back in action Friday at Municipal Stadium against Kennedy. The ‘Hounds will host Torrington on Oct. 26. Hawks rallying: Woodland is also perfect coming out of the bye, but it took a little more work for the Hawks to get there. A week after needing a second-half outburst to pull away from Wolcott, Woodland needed a much more dramatic comeback Oct. 5 against St. Paul. Facing a 22-7 halftime deficit, the Hawks scored 16 unanswered points after the break, including a game-winning, 27-yard field goal by Angelo Kollcinaku with 3:01 remaining to earn a 23-22 victory. Edit Krivca continued his tremendous play with 23 carries for 259 yards and touchdown runs of 70 and 5 yards. Quarterback Tyler Bulinski also scored on a 1-yard run in the fourth quarter to make it a one-score game. Woodland will visit Sacred Heart-Kaynor Tech on Thursday at Municipal Stadium before hitting the road against Oct. 26 against Crosby. The Hawks will be heavily favored to win both games and enter the Nov. 2 home matchup with Ansonia undefeated.